I have wanted to make sausage rolls for the longest time. I spotted the sausage rolls recipe on both Food-4Tots and also Christine’s Recipes and added it to my to-bake list…finally, I found the time to bake these goodies. This sausage roll is probably more Asian than western baking. If I am not mistaken, it’s probably a Cantonese creation. If you go to dim sum restaurants or Chinese bakery shops, you will most likely find them, though I have also seen them at Japanese bakery shops. In any case, sausage rolls are quite a treat as I love sausages. I followed the recipe on Food-4Tots but for the wrapping, I chose the easier method on Christine’s Recipe (please click on the link to see the step-by-step picture guide). The end result was these cute and gorgeous looking sausage rolls that I just couldn’t stop eating. Homemade Sausage Rolls. So soft, so yummy, and wrapped with your favorite sausage. Get the recipe now. Put ½ portion of the flour and yeast in a bowl and combine. Add the sugar and salt and mix well. Pour the egg and milk mixture into the bowl. Use a large spoon (or pastry scraper) to mix everything together. Put the remaining ½ portion of the flour into the bowl and knead briefly to combine all the ingredients. Add the butter and knead the dough for 5-10 minutes or until the dough is soft, pliable, smooth and slightly shiny, almost satiny. You can also try stretching part of the dough, if it stretches into a thin sheet without breaking, the dough is ready. Put the dough into a lightly buttered bowl and cover with a damp cloth. Let the dough rise in a warm place until its size doubles (1 – 1 ½ hour depending on the room temperature). Cut the dough into 8 pieces, roll into a ball, cover with a damp cloth and let them rest for 10 minutes. Use a rolling pin to roll the dough into long cylinders, about 40cm in length (depends on the length of the sausage). Roll to enclose the sausage, with the end of the dough facing down. Place the rolls on a tray lined with parchment paper. Cover the rolls and let it rise until it almost doubles in size. Brush lightly with some egg wash. Preheat the oven to 200°C and bake for about 10-12 minutes or until the rolls turn light brown. I love sausage rolls and can remember many happy times drooling over and buying them from a Chinese bakery in Melbourne. Now I can try making them myself and hopefully they turn out as good as yours. They look so yummy – I almost want to grab one! You may very well be mistaken. The idea of putting meat inside bread/pastry/dough is obviously a fairly universal invention which was enjoyed by the ancient egyptians, greeks, romans, chinese etc. Flaky/puff pastry became popular in Europe around the 17th century; by the beginning of the 19th century the French were enjoying their croissants while their English rivals mocked them (according to legend) by selling croissants with sausages in them. The quintessentially British ‘sausage roll’ (a sausage wrapped in puff pastry, as universally enjoyed as “fish n’ chips” and “cups o’ tea”) became particularly popular during the war years and are now enjoyed not just throughout Britain but also in Ireland, Canada, South Africa, Australia, and New Zealand – all former British colonies. They’re also popular in the Netherlands. Given the Dutch/British colonial activity around Hong Kong and Southeast Asia in the 19th century I would suspect that this un-Asian-like snack was introduced to and adapted by the Cantonese. The difference between Chinese and European sausage rolls isn’t just the dough (sweetened bread in China, puff pastry in Europe) but also the sausages. The British sausage roll usually contains a chipolata-style sausage or just sausage filling – minced pork with herbs and seasoning. The chinese sausage rolls on the other hand usually contain heavily processed and sweetened frankfurter-style sausages. Looks so good. I do not get instant yeast here. How would I have to modify the recipe when I use active dry yeast? Hi Indu – I am sorry but I don’t really know as I pretty much just followed the sausage rolls recipe…sorry. Indu, I believe you can use both yeast interchangeably. ACTIVE DRY YEAST- needs needs to be dissolved with some sugar. INSTANT YEAST- contains yeast enhancer, and it’s usually more concentrated than active dry yeast. And this yeast does not need to be dissolved. RAPID RISE YEAST- contains large amounts of yeast enhancers and gives it a quick and instant rise, in less time. These look gorgeous! My kids love mini sausage rolls :) By the way, is the egg + milk mixture supposed to weigh 220g in total, or just the milk? Yup, these are Cantonese. They’re a staple at Chinatown bakeries, and often also called hot dog buns, at least on the east coast. When I worked at my parents’ bakery as a teen, I would just gobble these things up. Great photos! I love these… I used to eat them growing up. Very nostalgic food. I buy some whenever I go to a Japanese bakery which is unfortunately not close to home. I hope to make it one day at home! Sure Nami, and I am sure your kids will love these sausage rolls. Darryl has posted some intersting perspectives on savoury pastries. Although the concept may be ancient it seems that meat pies are only to be found where the British ruled in Victorian times- South Africa, Malaysia, Australia and so on. One will not find them for example in the USA because that country predates Victorian British rule. Anyhow a well prepared meat pie is the ultimate comfort food for me , but my Malaysian wife does not eat them at all. Interesting note about meat pie. I am so excited when I saw this recipe. This treat is my achilles heel, I would buy 2 dozens of those and freeze them in my freezer. I am so looking forward to making this at home. My question is how do you measure yeast and salt in grams? What is the measurement in tsp? I have an electronic scale so there was no problem to weight a few grams of stuff. yeah, an electronic scale def helps. I only have a manual scale. Maybe it’s time to upgrade… haha!! Oh, BTW, I found a site that actually gives out the simple table. If you don’t mind me sharing it here. I use regular chicken frank/hot dog, you can use your favorite sausage. Hey, you can bake pastry, ha, ha. That’s exactly what I meant Bee. I can’t bake if you paid me. I just want to ask about the sausage roll. what sort of cheese u at on the top to make it crispy. I saw those type of bread in the asian shop. Probably cheddar cheese, you can try it out! Hi Bee, your sausage rolls look so soft, beautiful and inviting. This is my daughter’s most favourite bread, that I grew up with it. Thanks so much for your link love! Thanks Christine, I baked it to light brown so it’s softer, plus they are fresh-off-the-oven soft. You really have great talent in baking!! The sausage rolls look very soft and fluffy. I would not resist them either. Thanks a lot for the link love!! Not sure about talent, I was just being lucky and the sausage rolls like me, that’s all. LOL. These look like a fun snack Bee- perfect fit for my daughter’s chunky hands! These look really cute!!! My sons will love them. Thanks for sharing this one…..
Wow, never seen sausage rolls like this, in the UK they are traditionally made with puff pastry. would like to try these as they look very nice. This is always my favourite bun! Another quick question… how can I substitute the Bread flour for All Purpose Flour? What adjustments do i have to make? Thanks. Lovely sausage rolls! I’m craving for it now! gosh, bee, these look perfect! if i didn’t trust you, i’d say you bought them from the best bakery in town. who says who says you can’t bake?! thumbs UP! Hi the top of ur sausage roll looks soft and fluffy. Mine is a little hard though. May I know if u cover the top during baking? Love this! Sausage rolls (with mayo and nori, please) were a staple of mine from Japanese bakeries. I can’t wait to try this at home. 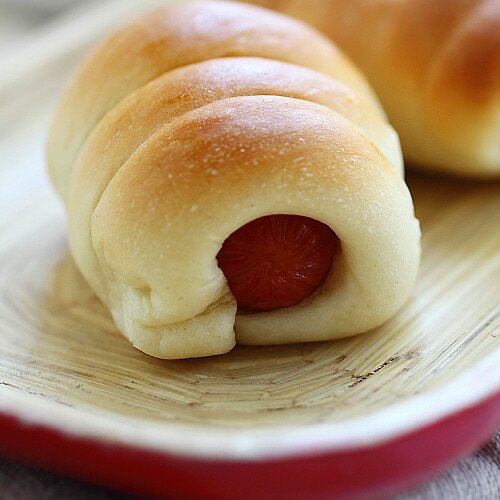 Growing up we always called these “pigs in blankets”. They’re good with a small hunk of cheese wrapped in with the sausage, too. I m using Kenwood bread macine to help me knead the dough. Do you think I can use these recipe? I am thinking o add all ingredients into the bread macine one by one, it means egg and milk at the bottom of the bread pan, cover by flour then all others dry ingredients + butter. The bread machine will start to knead for about 15 to 20 minutes (include some rest time) once all ingredients are put accordingly. Thanks. I am sorry but I am not sure! I am not familiar with the bread machine! Tried and tested!!! Verdict is… EXCELLENT! the dough is soft and really taste good, hubby loved it! I make this from time to time for his office lunch. I made these for breakfast yesterday and they were amazing! You can’t get this kind of Asian-style bun in the UK. One thing I have to say though is that my sausages weren’t as cooked as I would have liked (I used proper pork sausages, not frankfurters/hotdog sausages). Just a note to anyone else out there who plans to use the same, you might want to let them brown a little in a skillet before wrapping them in the dough. Thanks for the recipe, I’m definitely making these again! must the temperature of the milk be warm in order for the yeast to activate? or cold milk is ok also? Warm to activate the yeast. Hi, I really love your recipes. I followed the recipe of this sausage roll but my dough turns out too sticky and i couldn’t knead it properly. It’s my first time making bread. What should I do? Hi Eve, sorry that you had problems with the sausage roll. I tried the recipe from my friend’s site and it worked very well. If it’s too sticky, add a little more flour and knead until the dough doesn’t stick to your hands. Good luck. I just wondering, how much is the milk in ml instead of grams as about in your recipe. Hi, are sausage rolls different from pigs in a blanket? I noticed that the sausage are wrapped in biscuit dough according to the recipes, instead of bread dough. Oh also, will it be okay if I use all purpose flour? Instead of bread flour. Should be OK I think. I always buy these at the Chinese bakery. I also notice that they usually have a sweet sticky glaze on top. Do you know what they use to create that? Hi. Can I please check if I can prepare the dough the night before and do the final knead in the morning. Will it last? And if yes, do I leave it out or in the fridge? Can i replace bread flour with all purpose flour? Hi..is that we must to cook the sausages before..or just roll directly and baked…confused a bit? Hi, can i replace bread flour with multipurpose flour? Hmm, I think you have to use bread because you want the bread texture. Hi Vivien, that’s very strange. What flour did you use? Is your sausage watery? Next time also grease the paper.